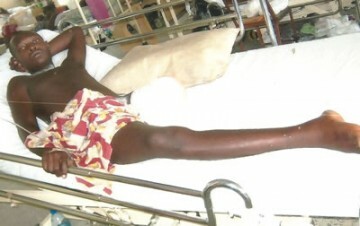 Narrating the incident to our correspondent, the victim’s father, Chief Nta Asuquo, said his son, an SS II pupil of Government Science School, Henshaw Town, Calabar South, was shot by one of the members of a team of anti-robbery policemen from Efut Division, who stormed his compound to arrest his daughter. He said, “My son’s ordeal started at about 2 pm on that fateful day when a team of anti-robbery policemen from Efut Division stormed my residence at 90, Edibe-Edibe Road, Calabar South, in a commando style to arrest one of my daughters, Miss Martha Asuquo, on a trumped up allegation of threatening the live of one of the neighbours. “On arriving at the compound with a police pick-up van, the fierce-looking officers requested to arrest my daughter for allegedly assaulting one of the neighbours, a lady. I obliged. “I was made to understand that my daughter had a misunderstanding with the lady, who decided to use her contacts with the police to arrest my daughter. In the petition written on behalf of Asuquo and addressed to the state Commissioner for Police, Mr. Osita Ezechukwu, dated April 30, 2012 and titled, A case of Malicious Shooting of Master Asuquo Nta Asuquo,” his Lawyer said it was unfortunate that the Nigeria Police had not learnt any lesson, not even with the rebranding campaign of the acting Inspector-General of Police, Mr. Mohammed Abubakar. Nigeria police will never learn. Sad! If not why would they just shoot someone who didn't commit a crime.